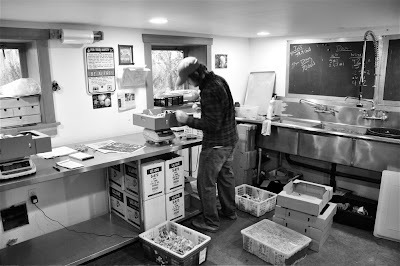 In my ongoing effort to be a commercial mushroom gadfly—or maybe just a fly in the ointment—I hung out with the fellas at Foraged and Found Edibles the other day while they packed up a couple dozen restaurant shipments and made deliveries. It was a relatively quiet day. When I arrived at the warehouse (the owner's basement), Jonathan and Shane were busy sorting and cleaning mushrooms. Order by order, they packed chanterelles, porcini, and other mushrooms into cardboard flats and weighed them. A fan in the corner dried porcini and watercress soaked in a washbasin. An hour later the packing was done and it was time to make deliveries. 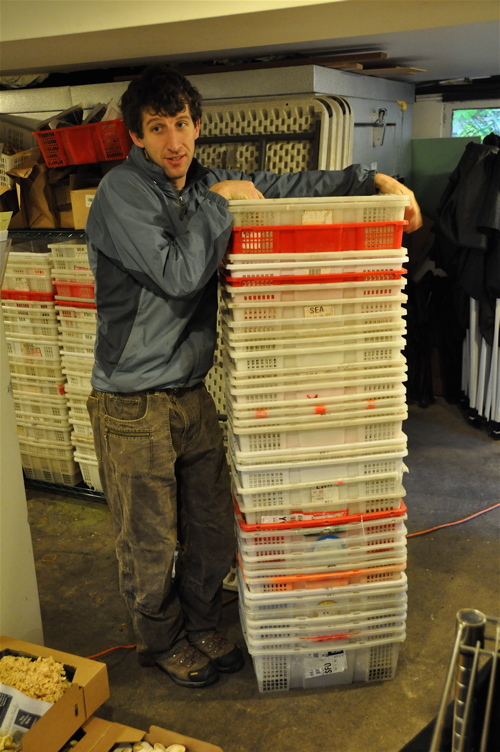 Jeremy, owner of Foraged and Found (pictured with a stack of baskets) owns a fleet of three Astro vans for the purpose, all of them used and cheap. He beats these vans like rented mules on the logging roads of the Pacific Northwest, but not before squeezing a couple hundred thousand miles out of each one, averaging more than a 100,000 miles a year. Jonathan would cover east side restaurants for this delivery; Shane had the city. I hopped in with Jonathan, a CIA (NYC) graduate and former sous chef. Our first stop was his old employer, the Herbfarm in Woodinville, Washington, one of the Northwest's most celebrated restaurants. I had the good fortune of eating there last spring with my food blog pals Hank Shaw, Holly Heyser, and Matt Wright. The Herbfarm doesn't serve lunch, so the atmosphere was relaxed. Owner Ron Zimmerman came out to greet us (pictured taking possession of his beloved fungi at top of post). Right now he's doing his popular annual Mycologist's Dream menu and his order was both the biggest and most diverse, including chanterelles, yellowfoots, matsutake, both #1 and #2 porcini, a cauliflower mushroom, saffron milkcaps, hawkswings, and man-on-horseback mushrooms. Ron picked through the mushrooms with a knowing hand. We made some friendly chitchat and then headed off. Next was Cafe Juanita, a perennial favorite on the north shore of Lake Washington in Kirkland. Chef-owner Holly Smith won a James Beard Award in 2008 and just seeing her face light up at the sight of a 10-pound bag of wild watercress was worth the trip. She teased out a strand and munched it approvingly. Our last stop of the day put these first two deliveries in stark relief. The cook looked stressed out and annoyed at our presence for some reason that was never articulated. "How's it going?" Jonathan said, trying to be friendly. "Busy!" the cook snapped. I have two children under 11, so I know "acting out" when I see it. It's not a pretty sight in an adult. The cook slapped his dishrag on the table and grabbed Jonathan's receipt book, which he slammed against the wall before signing for the goods, then handed it back without a word. 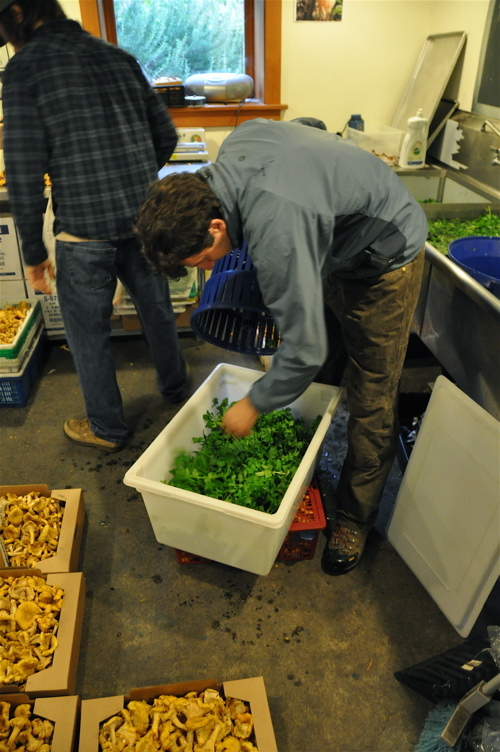 He kicked his new box of watercress to one side and had someone take away the mushrooms. So much for fresh local ingredients. Some people are in the wrong line of work. Jonathan told me one of the hardest parts of his job is trying to educate clients who don't get the grading system. Even well known and long-standing restaurants don't always understand that #1 porcini and matsutake buttons will be varying sizes, not always cute and petit. 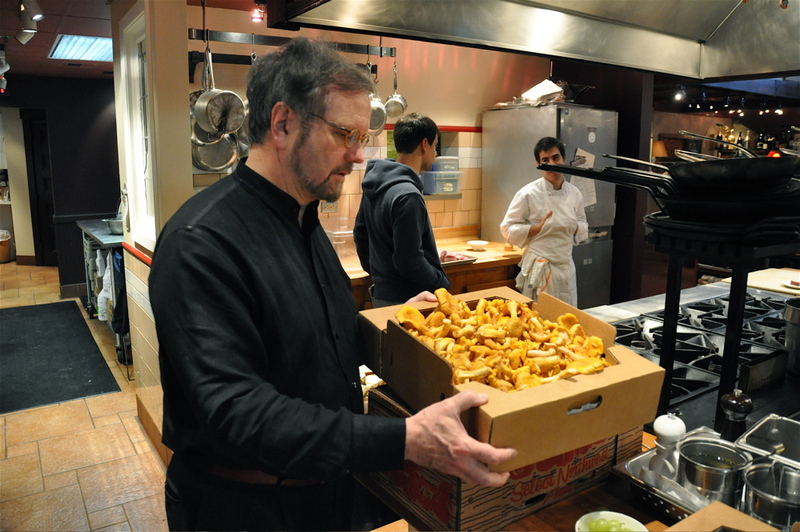 "It's not as if mushrooms are grown like tomatoes in a mold," he said. "They're wild." That's the point, but sometimes people want their wild ingredients to behave like conventional supermarket produce, domesticated and submissive. For years now a variety of cranks and schemers have tried to figure out the secrets of ectomycorrhizal fungi in order to grow them like a crop. Let's hope they fail. Just ate at the Mycologist's Dream dinner at Herbfarm the day the mushroom feast opened. It was such an amazing feast of flavors. I loved how they incorporated all types of mushrooms into their dishes, included some sweets! I'd love to photograph some of the 'shrooms one of these fine days. They are fabulously "imperfect" models. I would not want them to be "uniform" and it would seem anyone who did has way too much time on their hands. An interesting dichotomy in chefs. It is a very challenging job, no doubt about it. Some people just can't rise above the stress. I'm with Jackie. On the photography. Chuckeled at the i-phone on the counter next to the pad of paper and pencil. Wow, amazing to hear of the petulent chef. Too bad he's just paying lip service to wild and local foods. I've got a tip for him, Walmart sells some fab produce, which is absolute plastic perfection, cheap too. I live in the Rockies and haven't seen a mushroom in months, but those boxes look to contain riches to me. I get a little jealous reading about all of the mushrooms in the pnw right now. Where are those beautiful boletes coming from? I was hiking up near Darrington a few days ago and found just one - albeit perfect - porcino. Are those from the coast? It's getting pretty cold up in the mountains. Jackie - Jealous! 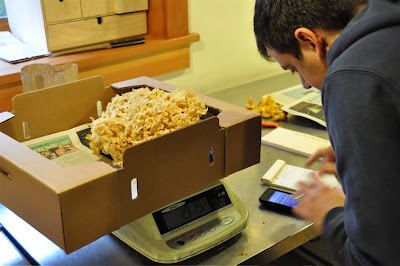 The Mycologist's Dream menu at Herbfarm is testament to fun with fungi in the kitchen. They're fun to photograph too. Theadalynfarm - That would be iphone slash calculator. Ah, the new millennium. Butterpoweredbike - I realize that cooking for a living can be incredibly stressful and don't want to minimize that. Maybe the guy just needs a vacation. KLambert - Mountain boletes are basically done in WA and northern OR Cascades. 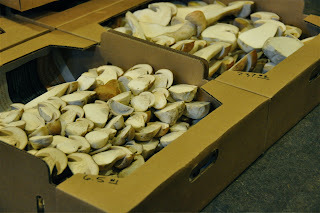 These pictures showed the last gasp of the WA coastal bolete pick. I was in Rockaway Beach, OR, this weekend and they're pretty much done there too. California should be starting. Thanks for the info. I'm heading to the Siuslaw forest this week so hopefully I'll find a few boletes, maybe some chants if I'm not too late. I did find a huge boletus edulis right in Discovery Park yesterday. Weighed two pounds and in great shape. Tasted great, too.